Why you need to see Galway, Ireland! Popular attractions in Ireland include the Ring of Kerry, the Belfast black cab tour, Dublin city life, and natural phenomenas like the Cliffs of Moher and Giant’s Causeway. However, little gems such as the city of Galway are typically not found unless it is included in a bus tour to one of those major attractions. This is such a shame because there is so much rich history, interesting legends, and amazing food Galway has to offer! While on my tour with Wild Rover, our guide Tony gave us a walking tour of Galway. We had the option of exploring ourselves but I am so glad I did the walk! On our tour we happened upon a red and black bar named “King’s Head Bar.” At first look you’d think it was just a kitschy new age bar for the area. Come to find out, it is actually one of the oldest buildings in the city that was granted to the person who executed British King Charles I in 1649. Two Irish soldiers named Gunning and Dean were chosen to execute King Charles I, and the one who actually did it (Gunning) received that piece of land in Galway where the bar currently stands, and the other was given a random piece of land in the middle of nowhere. The building started out as a pub and became several other businesses throughout the years until 1979 where it became the King’s Head Bar that it is today. When you visit, make sure to try their very own brew called King’s Head! Galway also has interesting legends attached to it, especially the one relating to the origin of the word “lynch.” Back in 1493, James Lynch Fitz Stephen, who was the mayor of Galway at the time had a son who was an utter disappointment. His entire life revolved around babes and booze and he was wasting all of his father’s money. His father said if he didn’t get his act together he would disown him, and gave him one last chance to make something of himself. Mayor Lynch decided to give his son a large sum of money to make a business for himself and make him proud. His son decided to take the money and work with Spain on a wine trade deal. On his way to Spain however, he ended up spending too much of his father’s money on broads and alcohol and didn’t have enough for the deal he originally set up. He then arrived to Spain and hoodwinked his contacts into giving him free cases of wine to bring back to Ireland that he would pay for after they sold. His contacts didn’t trust him, so they sent along one of their men to keep track of their goods. On the tail end of their trip back to Ireland there was a huge storm and the son committed murder by throwing the spaniard overboard in front of his crew. He figured he could get away with the free wine and blame the spaniard’s death on the storm. Nobody said a word when they arrived back home, and Mayor Lynch welcomed his son back with open arms. Not too long after however, the spaniard washed up onto shore and an investigation was conducted. Several crew members fessed up about the son committing murder, and soon after the son was sentenced to death. Mayor Lynch then decided to carry out the sentence himself in order to set an example of zero tolerance to violent crime and to keep the peace in town. The act of Mayor Lynch hanging his own son then became the legendary origin of the term “lynched!” This is one of many interesting historical legends Galway has within it’s cobblestone streets. Finally, everyone’s favorite attraction to any city: THE FOOD! 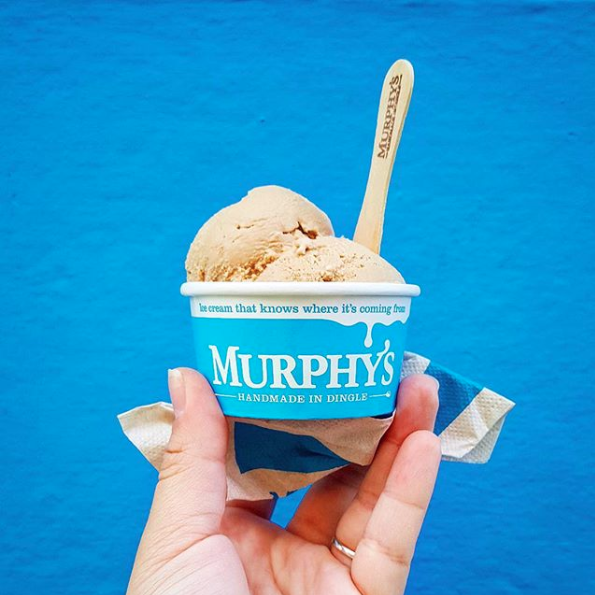 While on the tour I found my favorite Irish ice cream shop called “Murphy’s.” While there was plenty on the menu, only one flavor seemed right to order as a total tourist: Irish Coffee flavored with real Bailey’s Irish cream! On top of being absolutely delectable, the actual shop itself is quite #InstagramReady! Since I decided on the walking tour instead of free time to myself, I didn’t get a chance to eat at more than one place. However, since I loved the town so much I did some research for my next trip and these are the places that are on my list: Seven Bar, West Restaurant, and The Lock Keeper. You CAN Travel Well While On A Budget!